As many of you know, we are huge supporters of animal rescue, and give a donation to Second City Canine Rescue in honor of every couple who hires us to do their wedding photos! Last week, we had the chance to work with SCCR to bring some awareness to the awesome things they are doing with homeless dogs in our community. 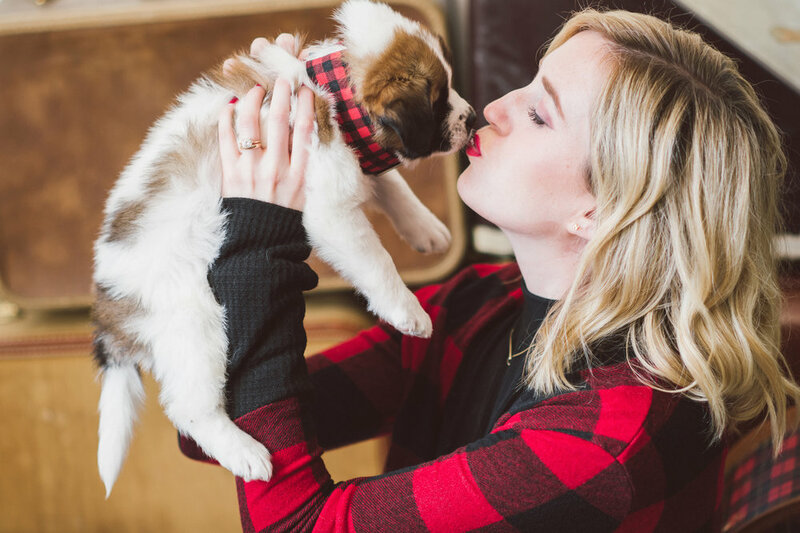 Recently SCCR rescued a beautiful, skinny, and amazingly sweet Mama St.Bernard who had just given birth to 8 happy, healthy, and chunky puppies. We were so excited when the puppies were finally old enough for us to make some magic with this stunning family. We teamed up with the lovely Christine Nendick, of Rescue in Style, to start collaborating on ideas. We then reached out to Kate Lerman of Chicago Vintage Wed. Kate is an incredible force in the wedding industry - and we also happen to know that she is a huge advocate of rescue! 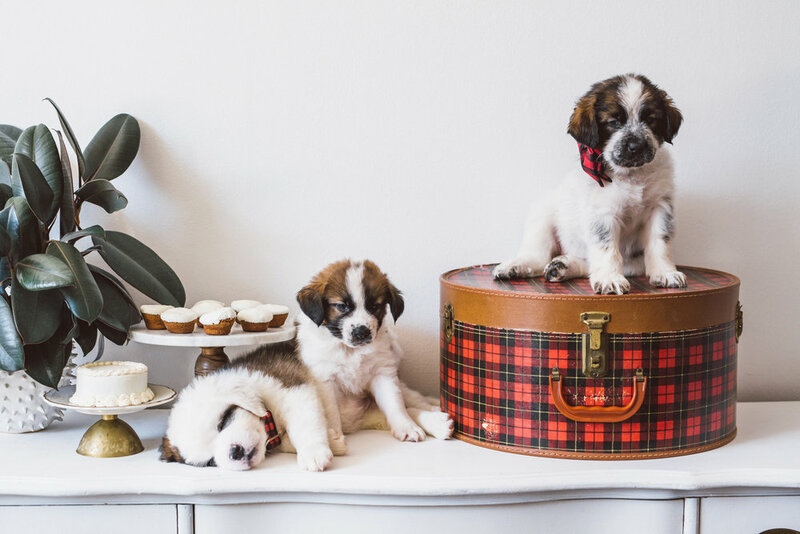 We decided to do a simple photo shoot at Chicago Vintage Wed’s Pilsen Studio, and incorporated the use of Buffalo Plaid, an adorable mini Liver Cake, and 8 teeny Peanubutter Pupcakes provided by the Happy Dog Barkery (if you have pets and live in the western suburbs, the Happy Dog Barkery is a MUST for all your pet needs). We had so much fun snuggling the puppies and we were completely blown away by how sweet and gentle their Mama is. All morning long, we kept commenting on how we wished we could always have Monday mornings like this! 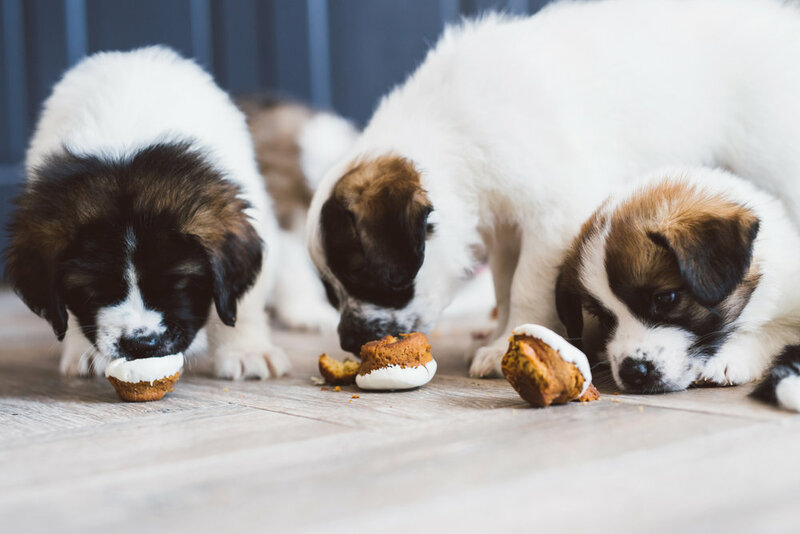 These puppies are not yet available for adoption, but watch SCCR’s website to find out when they will be looking for homes (hint, they’ll start accepting apps Nov 12th). Here are a few of our favorite images from the shoot. Make sure to check out Christine’s post, on Rescue in Style to read a bit more about the shoot and the awesome things Second City Canine Rescue is doing! You all know how much we love our pets, so we are always excited when people want to include their pooches in their sessions! Could their little guy, Joey, be any sweeter? 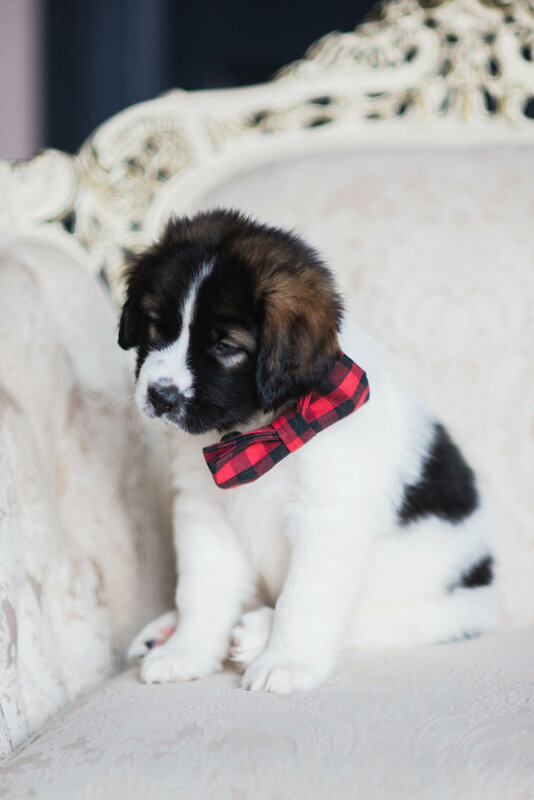 That bow-tie just kills me! Melissa and Brian chose to do their Engagement Session at Lilacia Park, and the flowers couldn't have been more perfect! We then cruised over to the local DQ, before ending up at their house for a few more shots. I had so much fun with these two, and we can't wait for their wedding next year!